After months in the making, we are pleased to present our very own "Cynthia's Baby House". This project is certain to be a wonderful addition to any miniature collection. 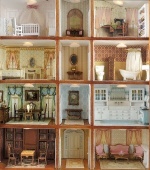 We'll start with the 1/12 scale baby house cabinet. This was made exclusively for us from our design, by our good friends at Bespaq. You all know I am a huge fan of Bespaq, but I have to tell you, this time, they really outdid themselves. The detail and depth of the carving on the bottom doors is simply stunning. The piece is beautifully scaled, with elegant proportions. The doors feature LOTS Of glass so that you can easily enjoy the contents of the house. And there are four floors, each with two rooms and hallway, for a total of 12 spaces to decorate. Each room and hallway is lit. LED chips are used throughout, and are battery powered. The batteries and on/off switch are conveniently hidden behind the lower doors. 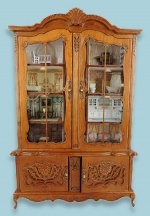 With a cabinet this gorgeous, only the best in furnishings would do, and we gave it our all. The wallpapers are all original designs which feature wonderful window covering illustrations from antique catalogs and publications. They are just darling. The wallpaper is carefully coordinated with the floor coverings, either the darling printed tile designs for kitchen and bath, or the printed rugs for the other spaces. Framed artwork is chosen to coordinate with each room. We even printed the fabric on the bedspread to coordinate with the wallpaper. The furniture is all laser cut and highly detailed. Some pieces are basswood, but the most delicate are made from our wonder board. This super strong material allows us to cut incredibly fine pieces that are STRONG and not brittle. Even the finest legs are sturdy and this material can be painted or stained. 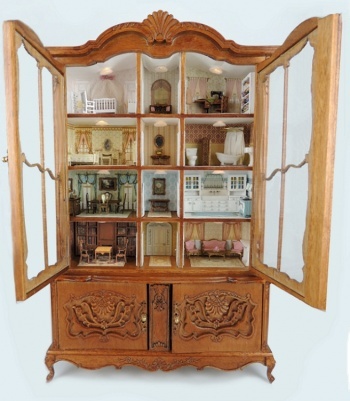 Look at the tiny details in the bedroom vanity. Those little spindles would be nearly impossible in any other material. In addition to the laser cut pieces, we have used our 3D printer extensively thru this project. The bathroom fixtures, kitchen sink and awesome stove, the sewing machine and mannequin.. all of these pieces are 3D printed. They come to you with great detail, and require almost NO cleanup. This is the nicest baby house bathroom set I have ever seen... much more detail and thinner parts than those old metal castings we used to have to settle for. As always, everything you see in the photos here is included in the kit. Wall coverings, floor coverings, furniture kits, artwork, doors, lighting supplies, even the little fry pan on the stove and the tiny vases of flowers. Students will need to supply basic tools and supplies such as paints and glues. An extensive online tutorial will take you step by step thru the entire process of lighting and furnishing your baby house. Please look at the additional photos below. If you have any questions, drop us an email! Thanks.